Fishing Report: Flock To The Piers! In the Volusia county area the beach piers are where all the hot action is. The Main Street pier in Daytona Beach has been producing slot sized redfish, black drum, whiting, angel spadefish and some sharks. The bite has been steady but there are two or three "15 minute windows" where the bite is just incredible and then after that the bite subsides. The shark fisherman have been using large dead pinfish and cut horse mullet. The sharks have not been very big but they are decent sized. There have also been a few good sized flounder being caught as well. The largest I saw landed was around 20inches. The hot baits around this time of year have been dead shrimp and small finger mullet. 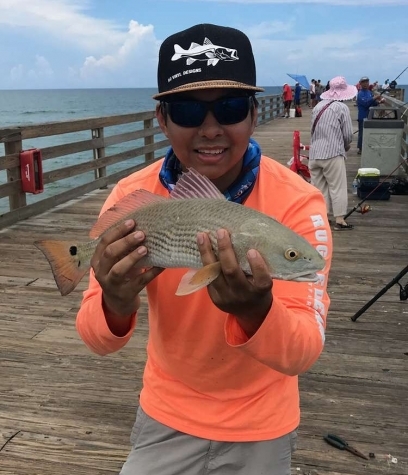 The Sunglow Pier has been a steady catch of whiting, bull reds, sharks and black drum. I have fished this pier for one day and I saw at least 7-8 large blacktip and spinner sharks being landed. I also hooked into a few bull reds but it was difficult to wrangle them out from underneath the pier. I also caught a few small blue fish and saw Spanish Macks chasing bait and busting a few hundred feet off of the head of the pier. The Flager Beach Pier in Flager County has just experienced a kingfish run where anlgers have been able to target these fish using big irons and big plugs. I have never heard of kingfish running this close to shore except in South Florida and Texas. The set up I have been using lately for this style of fishing has been my Star Rods Seagis 7'6 8-17lb with a 4000 Shimano Stradic Ci4+ spooled with 20lb braid and I used 30-40 mono leader.